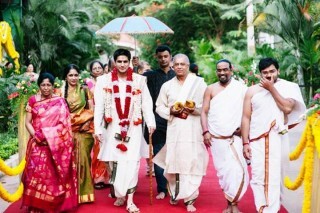 The ‘big fat Indian wedding’ comes at a big fat price that can dig very deep into your pockets! But despite knowing the extravagant cost of this extravaganza, it still becomes too hard to downscale the budget. It’s your wedding after all! Youonly get the chance to do it once in your lifetime! That said, you have to be smart about how you plan your wedding. 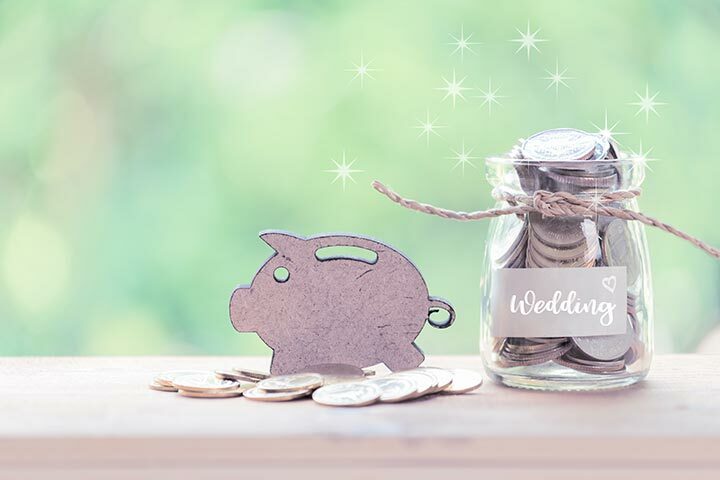 Or else, your budget can quickly shoot through the roof, leaving you with pre-wedding stress and tons of cancelled items on your wedding shopping list – enough to make you believe that dream weddings are, well, the stuff of dreams. If you don’t want that to happen to you, try planning the wedding of your dreams on a budget. 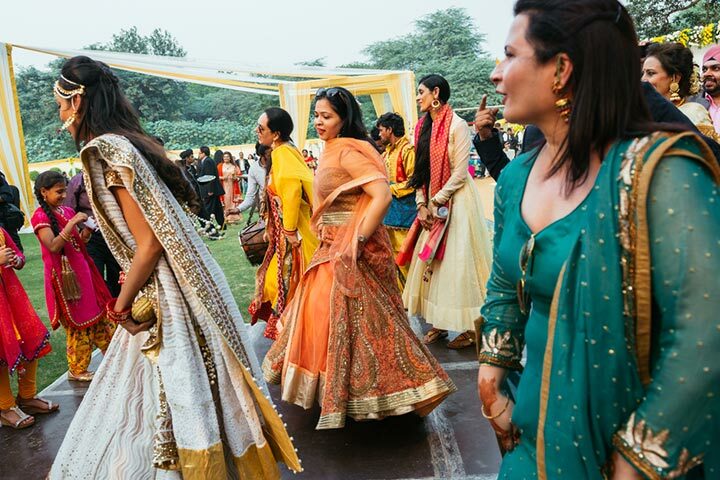 Although cutting corners is a crucial part of a budget wedding, the kind of corners you’ll be cutting are not something that will compromise in any way on the band, baaja, baaraat, and masti! 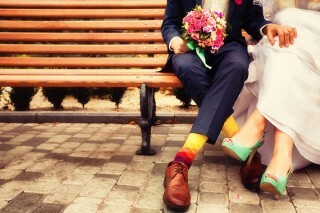 Here are 6 tried and tested ways that can help you pull off a wedding to remember on a budget! A big-ticket venue like a 5-star hotel is surely appealing, but is it wise considering your budget? Instead of booking a fancy hotel, consider an outdoorsy wedding in the suburbs or outside city limits. This will cost much lesser and present a pretty backdrop to your fairytale wedding! However, if you must pick a ritzy hotel, make sure you book it in the off-season as that’s when they offer huge discounts! 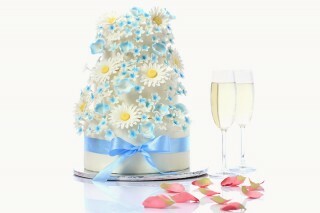 Also, keeping your wedding on a weekday can lower the cost of your venue considerably. Lastly, while choosing a venue, make sure you get the facility to pick your own vendors for catering and decorations rather than working with in-house ones. You can save a lot of money! Want only pink flowers that bloom late in the summer to adorn the halls of your winter wedding? That is going to throw your budget way out of limits! Off-season flowers cost much more than the ones that are in season. You go DIY on the decorations! 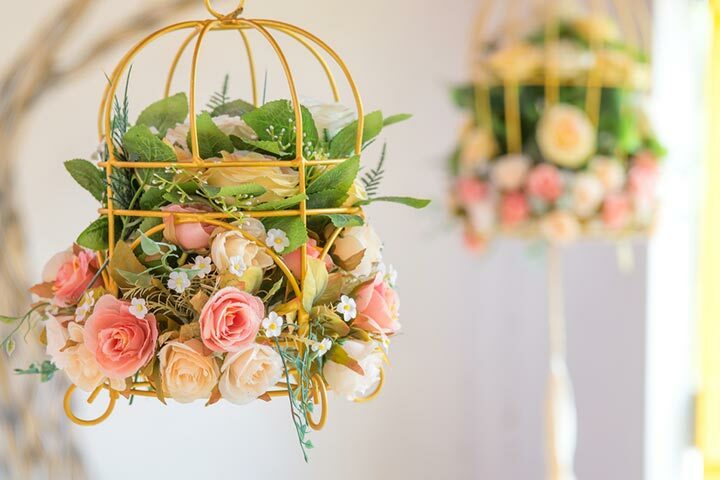 Hit up your local crafts store or wholesaler and pick up a bunch of artificial flowers and other decorative items to deck up your own wedding venue. You could rope in your relatives and friends to lend a helping hand to create a Pinterest-worthy wedding venue! When decorating, select a central theme and use that motif throughout to create a pleasingly gorgeous effect. 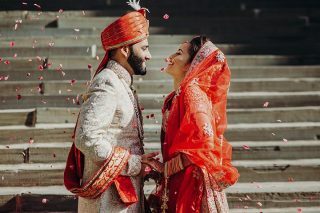 The best part of the Indian wedding is that it is a week-long affair full of fun, festivities, and countless ceremonies. 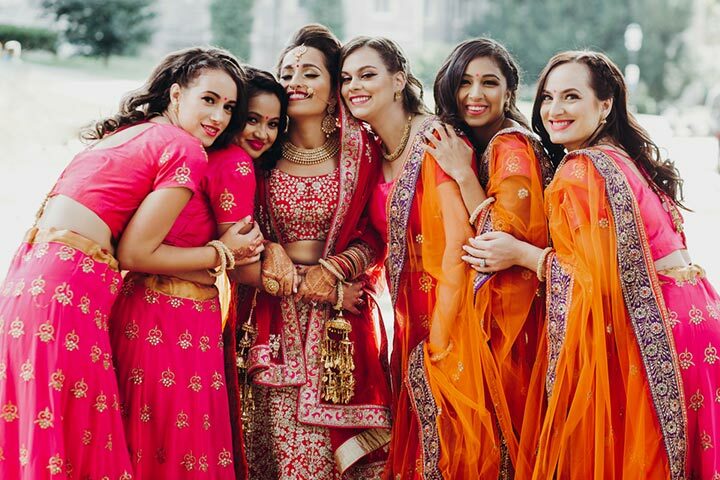 While they no doubt make the Indian wedding what it is, they are not exactly pocket-friendly. You have to prepare a guest list for every function and then even take care of the catering, all of which easily shoots your budget to the stars. The simple way to cut down on your expenses for these functions is to keep the guest list short and to host the events during late afternoons or early evenings. This can help you save the bills of catering as you would only have to provide snacks and refreshments instead of whole meals! What costs the most in a wedding? The bridal trousseau! Wedding lehengas alone start at 20 to 30 thousand bucks and that too the barely decent ones! If you want a designer one, you can expect a major hole in your pocket. Especially if you add jewelry to the equation! Well, you can try out some cost-cutting here too. 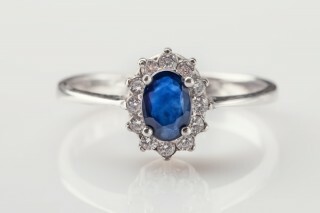 If you’re really keen on having designer clothes and jewelry, consider renting them instead of buying. However, if renting is not your thing, pick a design and get your dress stitched by your local tailor and pick out artificial jewelry that looks as good as the original! 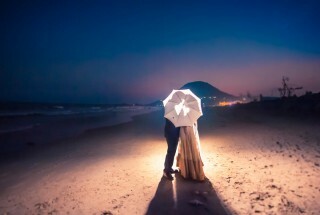 Another area that eats up a lot of your wedding budget is the photographer. The professional and experienced ones charge a bomb! And the only way you can save up here is by choosing a freelancer or fresher. After reviewing them, of course. Not only do they come cheap, they also bring fresh ideas to the table. Also, printed wedding cards are so passé (not to mention expensive). 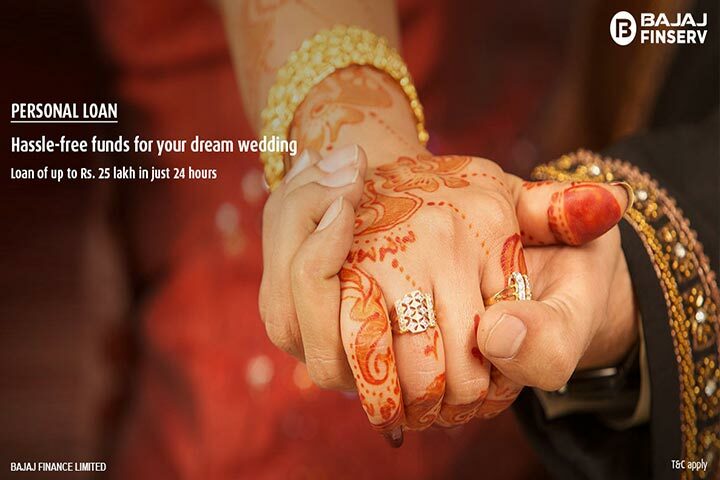 For your wedding, be the modern bride and make e-vites for your guest. You get a host of pretty and customizable templates online for free, which means that’s one area you don’t even have to spend on! Still a little short on cash for your wedding? 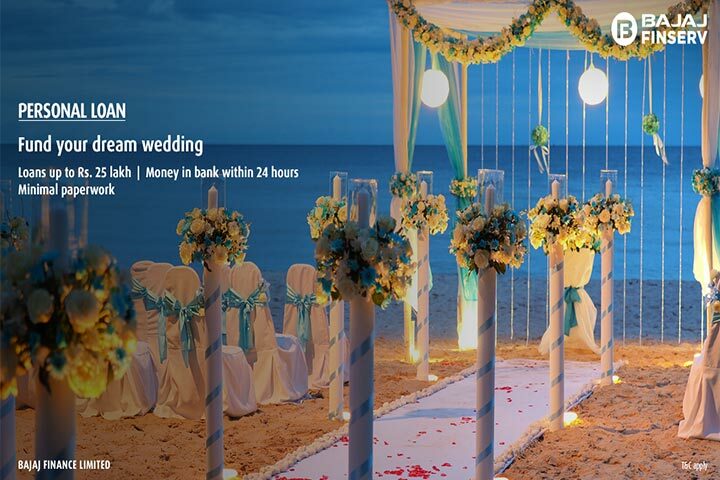 Take a Personal Loan for Wedding offered by Bajaj Finserv to cover the extra cost! Their loan terms are flexible and repayment options are easy. Plus, you can get a loan of up to Rs. 25 lakh with minimal documentation and loan disbursal within 24 hours. 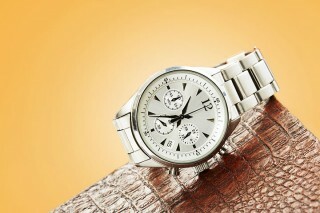 All you need to have is a minimum salary of Rs. 27,000 for Tier II cities and Rs. 37,000 for Tier I cities. This means no more compromising on the most important day of your life! You also get a flexi loan facility, which means you are charged interest only on the amount utilized and not the entire approved amount. For example, if you have utilizedonly Rs.12 lakh from the entire approved loan amount of Rs.20 lakh, then interest will be charged on only the utilized Rs.12 lakh.This keeps your EMI low. You can further reduce your EMI by opting for the interest only flexi loan variant. Here, you only pay the interest as EMI and pay the principal amount at the end of the tenor. Your wedding can be a reality even on a budget as long as you try out all the 6 tricks listed above. You’ll thank us for them after your wedding is done!